This restrained but decorative leaded-glass ensemble was discovered in the 1912 house during restoration, and re-installed. 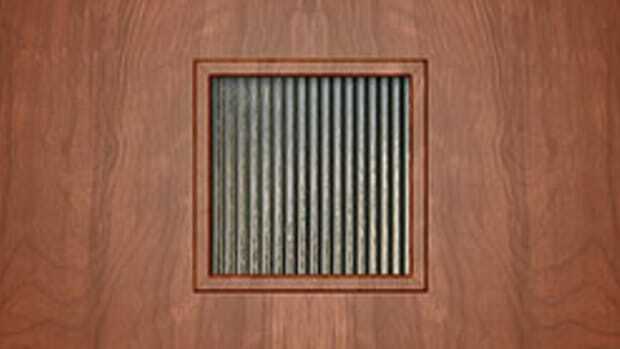 The large wood dividers between windows are called mullions. 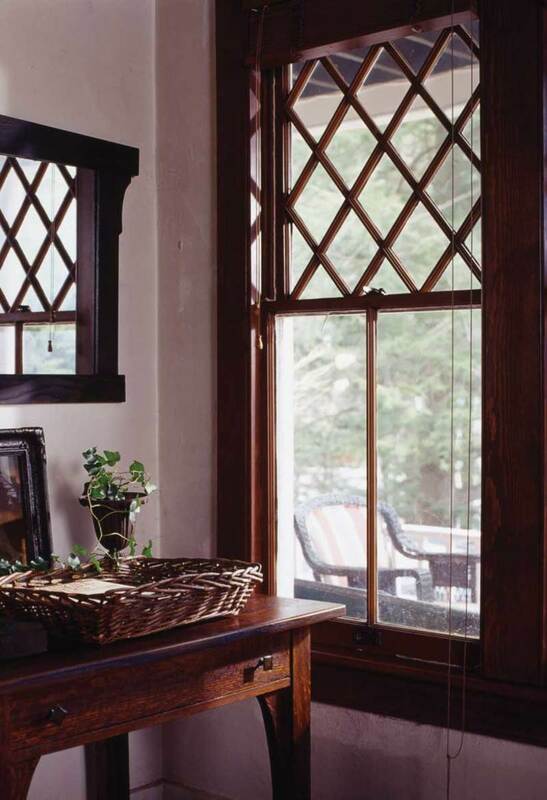 Like everything else about style in this post-Victorian period, double-hung and casement Arts & Crafts windows were an unobtrusive yet radical break with tradition. For example, the bilateral symmetry of Victorian doors and windows—which often were grouped in twos, as with side-by-side double doors and two-over-two window sash (double-hung windows with two narrow panes of glass in each sash)—was often abandoned for a less static rhythm of threes. A key example is the Chicago window, an early “picture window” with two narrow lights (panes) flanking a large center light. 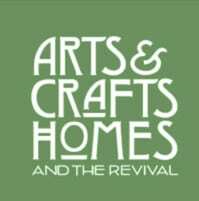 This simple change in the math resulted in the transition from tall and vertical (Second Empire, Queen Anne) to ground-hugging and horizontal (the Arts & Crafts Bungalow). You see this geometry and massing in residential architecture ranging from the Japanesque “ultimate bungalows” of Greene and Greene to the thousands of low-slung houses built by developers. 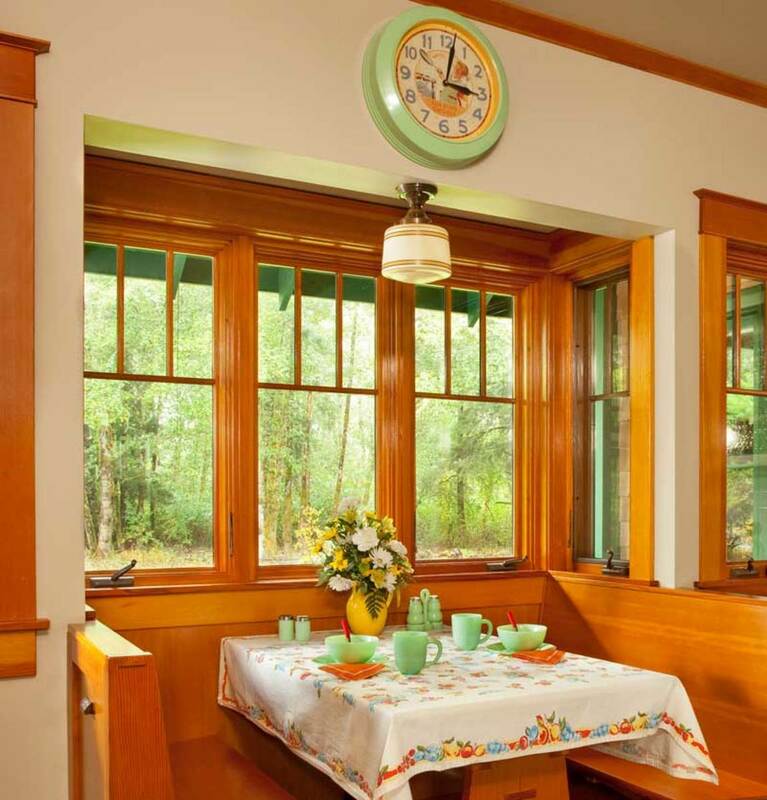 Three-over-one sash windows surround the breakfast nook in this new house. 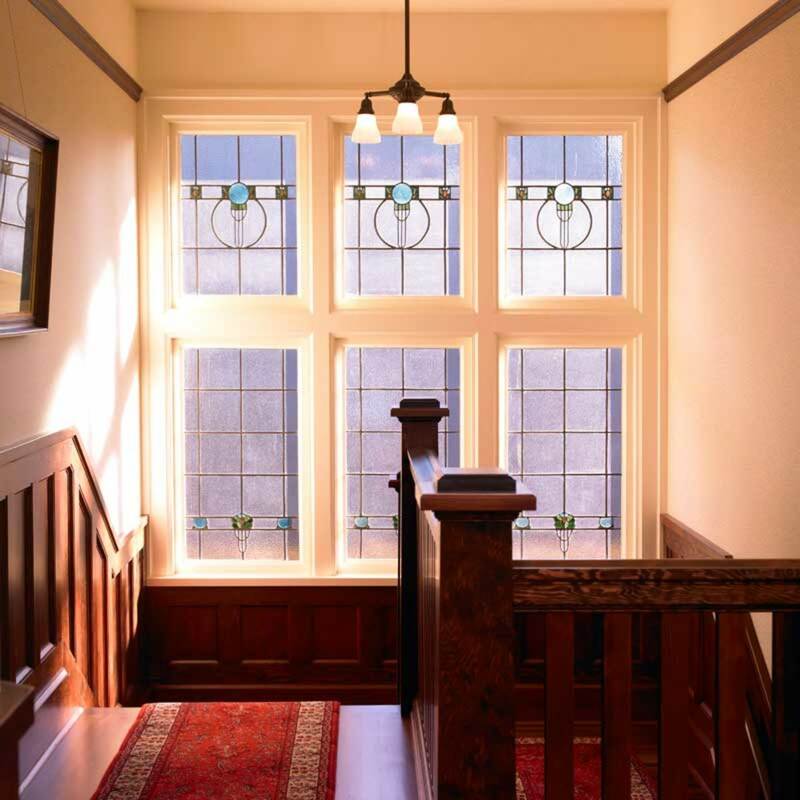 Think of it this way: Rather than the tall, narrower windows seen on Victorian styles like Italianate or Stick, the typical Arts & Crafts window has a three-light upper sash over a single-light sash. Variations include multiples of three in the top sash: six, nine, or 12 lights. On even modest storey-and-a-half bungalows, the living room’s large square or rectangular window is usually flanked by narrow three-over-one sash windows. Another variation is a large pane with a transom-like row of fixed, rectangular lights above. Diamond patterns formed by crossed or intersecting muntins are slightly dressier but not uncommon. 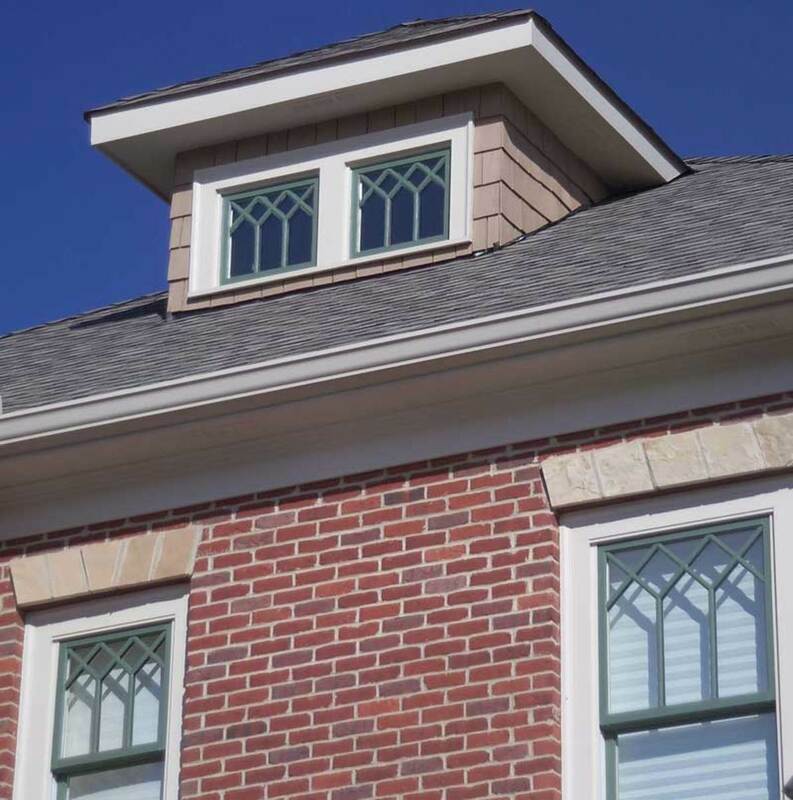 Custom windows in a new brick Foursquare in Georgia are right out of a period millwork catalog. 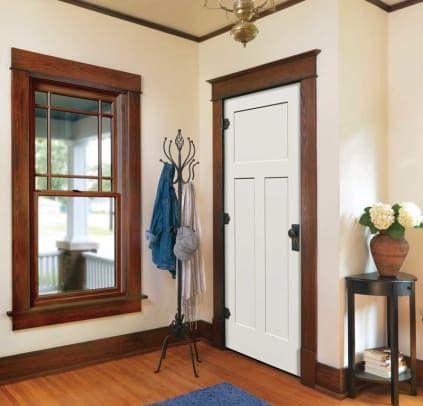 Amplifying the effect, double-hung and casement windows are often ganged in rows of three or more under a plain but simple group header—usually a flat, fairly deep, square-edged board—and share a common sill. 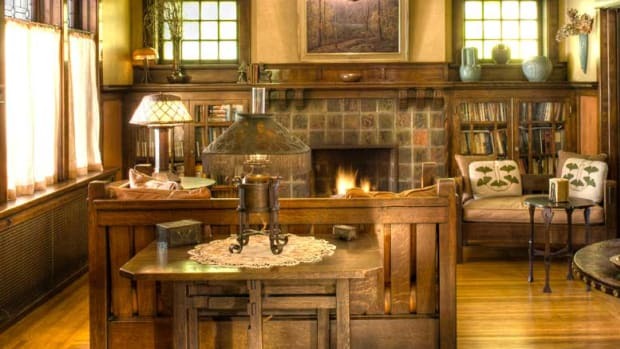 The straight yet ample architectural line this creates is unique, a signature element that marks a house as Arts & Crafts. In one configuration, a triple window alludes to the classical Palladian or Venetian window, three parts with hierarchy, but without curves. Exceptions exist, of course: Some American Foursquare and Prairie School houses have windows grouped in twos and fours. Curves and arches enter the picture in Romantic styles like Spanish and Tudor Revival. 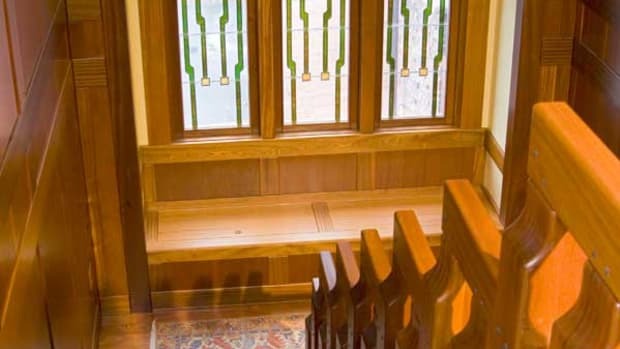 Leaded and stained glass windows are still in use in this period, but in relatively simple styles and configurations. Prairie School architects, who include Louis Sullivan and Frank Lloyd Wright, were the exception, creating geometric, never-before-seen designs. 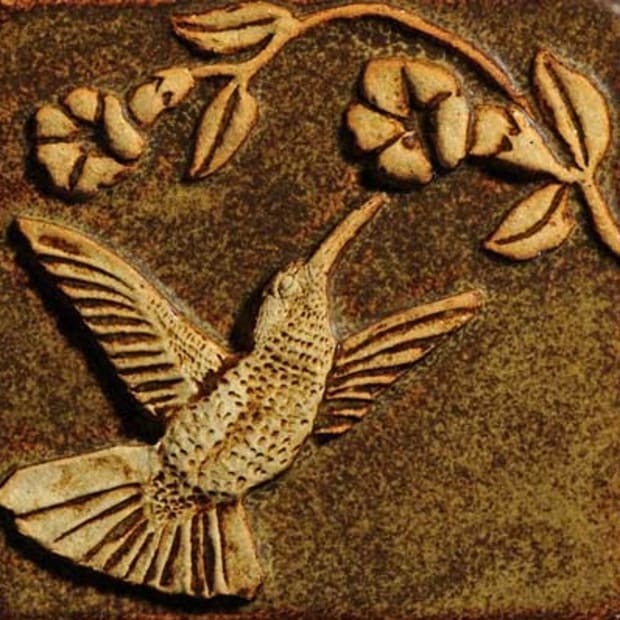 While the motif might be simple—a sunburst or a cat-tail, for instance—their designs were intricate compositions. Tiny bits of glass are fitted into chevrons to compose leaves; diamond shapes interlock and seem to be three-dimensional. It’s an architecture of light. Their tall and narrow windows are grouped together in rows of four to as many as 12, emphasizing the horizontal lines inherent in the style. 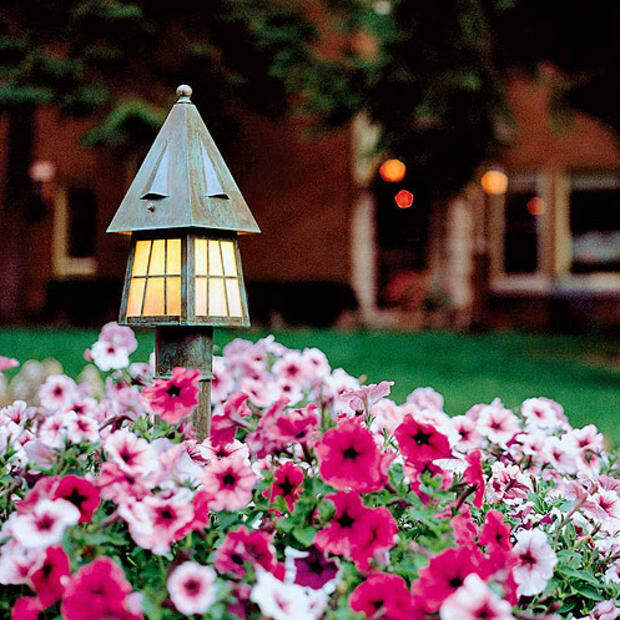 Leaded patterns provide decorative relief as well as some screening between indoors and out. The diamond pattern in the top sash of a vacation cottage likely came from a stock building supply house ca. 1920. 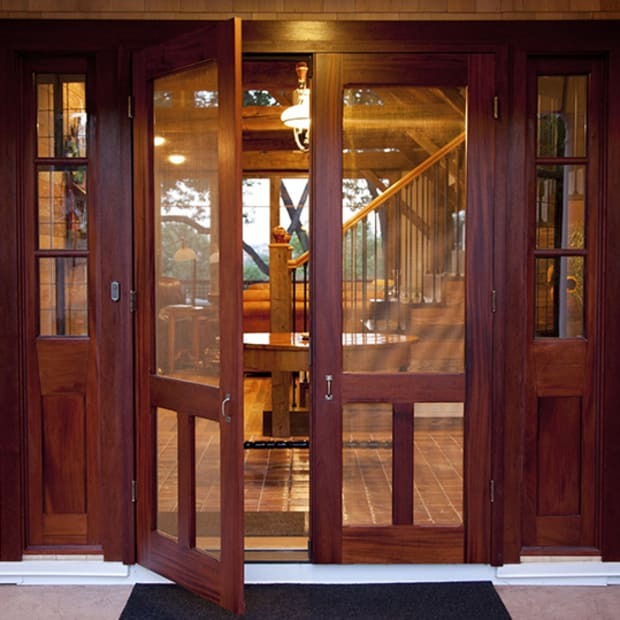 The demand for Arts & Crafts windows for new builds and additions is strong, and contemporary window manufacturers have paid attention. Marvin, for example, has long made wood windows to order and will match historic window sash. The company recently redesigned its sash window to provide a deeper sill with relief, more in character with those on historic buildings. Importantly, the lights (individual panes) are now taller and narrower (not square or horizontal), bringing them closer to period windows. Another key window detail is the muntin, the narrow bar that separates the glass into divided lights, or panes. For the most authentic results, copy the depth, width, and moulding profiles of muntins on existing windows when ordering new ones. Whether true muntins that separate individual pieces of glass, or an integrated grid, the muntins are important as they throw shadows that add relief to the façade. For years, owners have settled for stock configurations, only to notice after the windows are replaced that the house looks dramatically different. Fortunately, computer capabilities now make it easier for a window manufacturer to customize new windows of different sizes to match the proportions of older ones. Some preservationists prefer a slight alteration between the original windows and new ones, as on an addition, to make the record clear in the future.